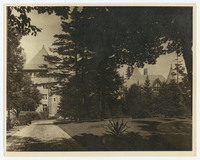 William Andrew Swanberg published this photograph and the photograph of Chatwold, shown below, in his 1967 biography of Pultizer. Best known for his biography of William Randolph Hearst entitled Citizen Hearst, he gave his papers to RBML in 1984. 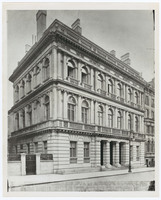 While this house on East 73rd street was being designed for the Pulitzers by McKim, Mead, and White, their house on East 55th Street burned during the night of January 8, 1900. Kate and the family members in residence that evening, and all but two of the nearly two-dozen servants escaped. One of the maids died when she went back into the burning building to try to retrieve Christmas presents. Chatwold, a beautiful estate overlooking the ocean in Bar Harbor, Maine, was the scene of great Pulitzer family happiness and anguish. Leased for two years beginning in 1893, then purchased, during the winter of 1895, it was rebuilt to Pulitzer’s specifications, including what his secretaries called the “tower of silence,” seen here through the trees, as well as a steam-heated underground room, excavated down through 53 feet of rock to sea-level to create a plunge bath. It was at Chatwold that Lucille died in 1897. Gift of Joseph Pulitzer, Jr.
Perhaps the only place on earth where Joseph Pulitzer was truly happy following the loss of his sight was at sea on his beautiful yacht the “Liberty.” Built for him by the Ramage and Ferguson shipyard of Leith, Scotland, for $1.5 million, the 300-foot yacht was christened in December, 1907. It was specially designed to minimize all noise, from the bulkhead to every door and porthole. In it, Pulitzer was able to travel around the globe in a cocoon of silence, served by a forty-five man crew, and a twelve-man staff of personal assistants to read aloud, play music, or provide conversation. 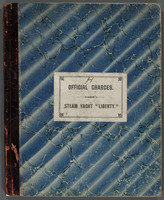 The "Official Charges" account book shown here includes fees paid for ship's papers, docking fees, canal portage fees, and tonnage taxes. 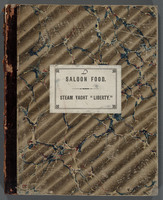 The "Saloon Food" account book, shown here and below, gives more of the details of life onboard the "Liberty." 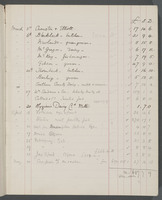 For example, the total charges recorded in the book for her maiden voyage of March through June, 1908, were £270.17.1 for meat, poultry, and fish.